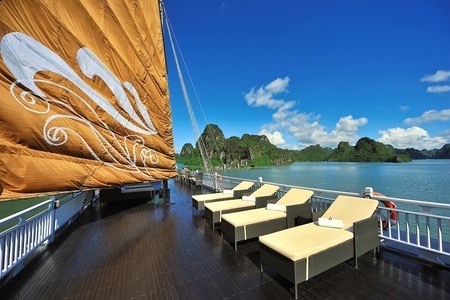 Paradise Peak offers unrivalled luxury and pure indulgence while cruising Vietnam's most famous bay. 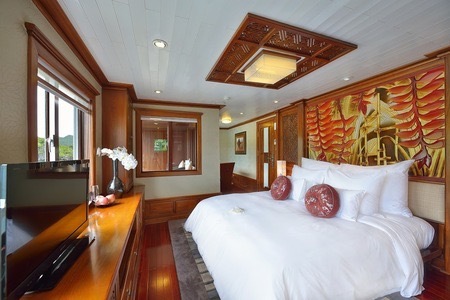 With just eight sublime suites on board, this boat promises an intimate and memorable experience. One or two night cruises are available. If you are looking for a five star experience while cruising this area of outstanding beauty then look no further than Paradise Peak. Sit back with a glass of sweet iced tea on your private balcony as you pass the huge, towering limestone karsts that rise out of the calm gulf for miles on end. 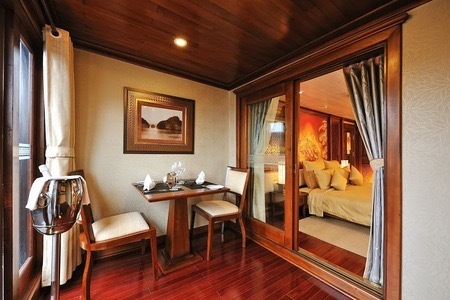 Paradise Peak boasts eight suites of three standards; junior, superior and premium. Everybody is given a personal butler and all suites are furnished in rich, dark woods and feature large (and extremely comfortable) double beds and have spacious bathrooms fitted with jacuzzi bath tubs and large rain showers. The junior suites on the first floor have a private dining area, as do the superior suites on the second and third floors which also have wide windows for uninterrupted views of the bay and a private balcony. The premium suites, which are slightly larger, have private bathroom balconies and frward facing sun terraces with loungers. The food served on board is second to none; whether it is a huge seafood feast lunch or a five-course dinner in the evening, Paradise Peak offers a five-star dining experience. 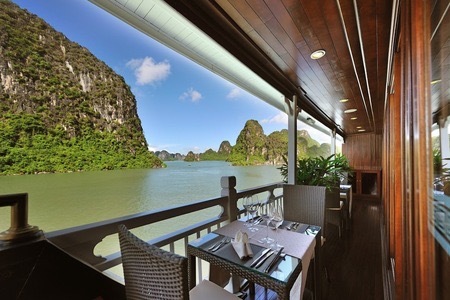 The restaurant, which is located on the third deck, is surrounded by large windows for spectacular views at meal times. Breakfast, lunch and dinner can also be served in your suite or on your private balcony. The boat, which feels more like a floating boutique resort, has a library and reading room on the first deck, as well as a fitness corner (with a treadmill that looks out to the bay), spa room, sauna and jacuzzi. Massage services are available upon request (at an extra cost), and Tai Chi sessions can be enjoyed at sunrise on the top deck. 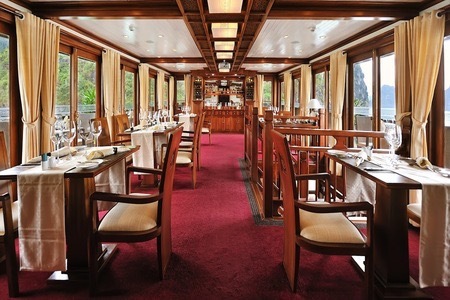 Out on the third deck there is a bar where you soak up the sublime scenery over an aged whiskey or old world wine. 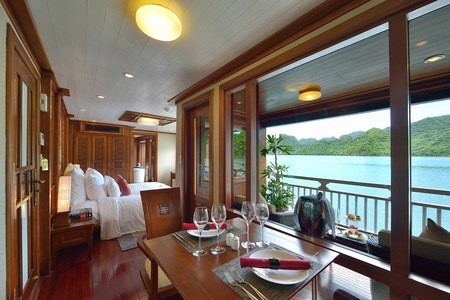 And on the top deck a large sun deck with beds and chairs offers a panoramic view of the bay. The itinerary changes throughout the year and no two cruises are quite the same. Possible excursions include cookery classes or food carving classes, trips to caves, lagoons or possible hikes as well as swimming, kayaking, biking and visiting floating villages. 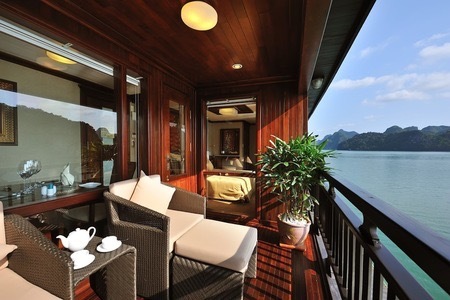 Those on two night cruises are also given a private day boat per cabin for the second day. Lunch, dinner and breakfast are included for each night on the cruise - as well as soft drinks and local beers and wines. Paradise Peak departs from a private pier on Tuan Chau Island, which is connected to the mainland by bridge. This is a quieter area and closer to the beauty of the bay, than the main departure point for other cruises. It is about three and a half hours drive from Hanoi and a shuttle bus can be arranged at an extra cost. 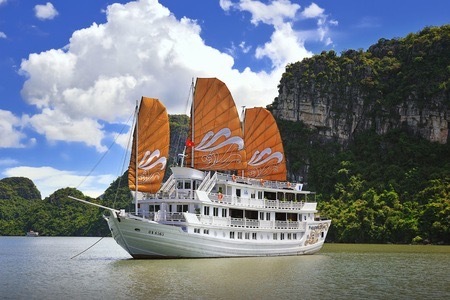 Arguably the finest cruising experience currently available In Halong Bay, we think Paradise Peak is very special indeed. You can read more about our personal experience on the boat here - http://worldinwords.net/luxury-cruise-in-halong-bay-paradise-peak.